This image was captured by a friend of mine, in my presence. This is another exciting image. It is dark. But look closely. What detail can you see? Hint: you may need to see in a darkened room. Looks like a figure on the right just standing there looking in the direction of the camera. Possibly another figure to the left. What was she taking a picture of? What was the location? Hallway, mirror, window? Yes in fact klainey. That is how this image was obtained. There are at least four entities. One on the left. Two people on his right seem to be talking with him.. There is also an onlooker In the middle. Can you see all this? I can see so much detail that just cannot be explained away as pareidolia. What is in the picture is unmistakable. Edited by markzerafa, 28 March 2018 - 02:26 AM. Okay... I get it now, using a dark background with a bottle. But I really would like to see the full-size photo shared as well. Can't really get a true perspective without it. Interesting photography you're experimenting with Markzerafa. OMG!!! 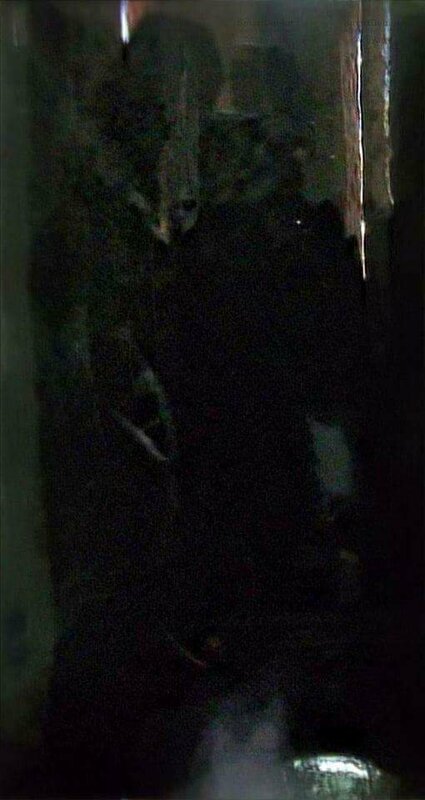 Those are some freaky looking "characters" in that pic....very spooky! Yes louczar. And to think that this was captured in my kitchen... Totally unnerving. They look freaky indeed but no doubt they are entities. Pareidolia? Not in this case. I will look for the uncropped image. Not sure if I still have it. I'm not sure how you can unequivocally state these are entities when dealing with a picture of such poor quality taken with some sort of experimental design. I am very aware of the pareidolia phenomenon, and quite often, I discard images which are likely to be just that; and yes, i agree that is not an exact science. And yes, it is subjective. It has to be. **However ** I - like several people, see distinct forms here, and I see essential details, which (IMO) cannot be pareidolia. That said, I respect your opinion. And whilst pareidolia may be an explanation, in this case, I very much doubt it. The quality of the image is rough. I can make out forms, yes, but I can not say without any question thay are or are not entities as you have said. Could we get some detail on the location and a bit of backstory? Thanks. I ran an analysis of the photo, through Image Edited. It came up questionable. So, this is really going to be hard to figure out. It most likely is pareidolia. The statement from the website is below. If you want a capture from the website let me know. Edited by MacCionoadha BeanSidhe, 28 March 2018 - 07:57 PM. I guess we can't really knock it until we try it. So, with that said... I will be trying similar photography in the next few days. Don't let comments get to you, Markzerafa... it's simply opinions that are being shared, that's all. The comments are not getting to me Jim. This is an opportunity to share and learn so bona-fide opinions are of course appreciated. Here's another picture however. Not my work, but I was present when it was taken. Is this also pareidolia? Is there a mirror in the back? I believe it is a black background and a glass bottle.